ACHSV opened its new showroom near Silverstone in late October 2016 – showcasing the equipment it offers alongside its latest builds and a preview of projects to come from its workshops. The company, which specialises in full vehicle builds and bespoke air-suspension conversations as well as the supply and fit of top-end off-road and expedition equipment, conceived the showroom as a new kind of premises for a UK off-road outfit. The idea is to provide somewhere clean and bright, comfortable and relaxing where customers can take their ease while planning a purchase. As well as an impressive display of products and marketing material from the world’s leading off-road and expedition equipment suppliers, the showroom features a variety of video screens showcasing its various products. ACH says it hopes these will give customers ideas for the way they spec their own vehicles. Among the equipment on display are items from ARB, Warn, Rival, Old Man Emu and Frontrunner. There are sections dedicated to winch bumpers, lighting, battery and charging systems, as well as various other smaller items. But it’s always about the vehicles. 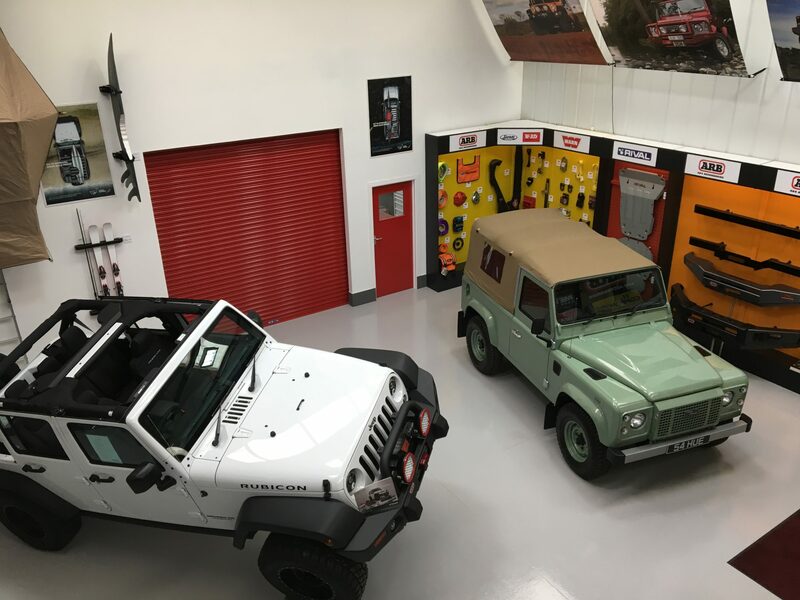 Currently on static display in the showroom area is a modified Jeep Wrangler JK, and on top of the workshop ramp on the open day was a Land Rover Defender 110 running one of the company’s air suspension conversions. The centrepiece next to it was a Ford Ranger Wildtrak which ACH explained to us has a dual life as a modded demo unit and a returned-to-standard tow vehicle. And of particular interest if you like your heritage was a Series III Land Rover which had recently been dragged out of a hedge and was set to go into the workshop for a full restoration as soon as the big event was over. Also representing Land Rover was a late Defender 90 built as a faithful replica of the last model off the line at Solihull in January 2016. This had been loaned by a customer – and others showed up in everything from a Twisted 90 and a 110 overland truck with Kahn body panels (yes, really) to a Ford F-150 and a rare modified Jeep Cherokee KJ. If all that illustrates one thing, it’s the breadth of projects ACH is willing to take on. The company says customer service is at the core of its approach, and that it’s always ready to sit down with prospective clients to help them plan the spec of their build. The open weekend was just the beginning – and a visit to www.achsv.co.uk could be too.